In this hyper-connected world, there’s a lot be said about heading to nature and disconnecting with technology, if only for a few days. We’d only been here in the Khasi hills for a day, and we were already starting to feel reborn, like the rest of world was some far-off planet. 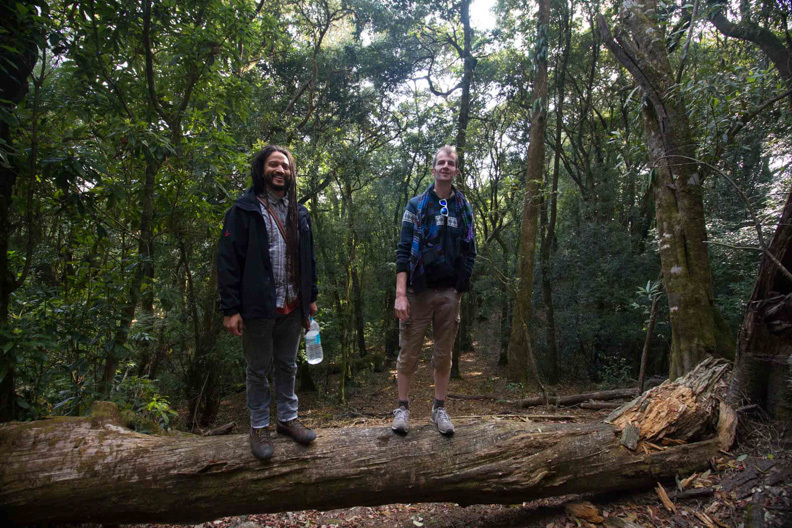 Going down: 3,000 steps and almost two hours get to Nongriat in the Khasi hills of India. Our journey began in Shillong, the charming state capital of Meghalaya in the northeast of India. In February 2016, I had accompanied my boyfriend to attend the Carnival of e-Creativity Conference (CEC) held at a university campus in Shillong. He was invited to participate along with 69 other experimental creative practitioners from across the globe. It was three days of artist talks, presentations, exhibits, concerts and a special Coding & Robotics Workshop—and during which time we heard so much about the mythical village of Nongriat that we knew instantly we had to go. We decided to extend our business trip to explore the Khasi hills. Crossing the steel wire bridge to get to the village. The Khasi village of Nongriat is nestled in the heart of a rainforest, surrounded by the Sohra Valley. For many years it was one of India’s most hidden regions, open to a handful of unrelenting explorers or an odd pre-booked tour, but still a mystery to most beyond its hills. It is a region where landscape reigns supreme, towering above the ancient village, giving travellers a taste of pre-modernist life in a rural Indian setting, where tranquility is still intact. Eventually, it was just the two of us, and five of our old and new friends from the conference. The preparations for our journey were made quickly; the next day, together, we started from the town of Shillong in a comfortable private cab. 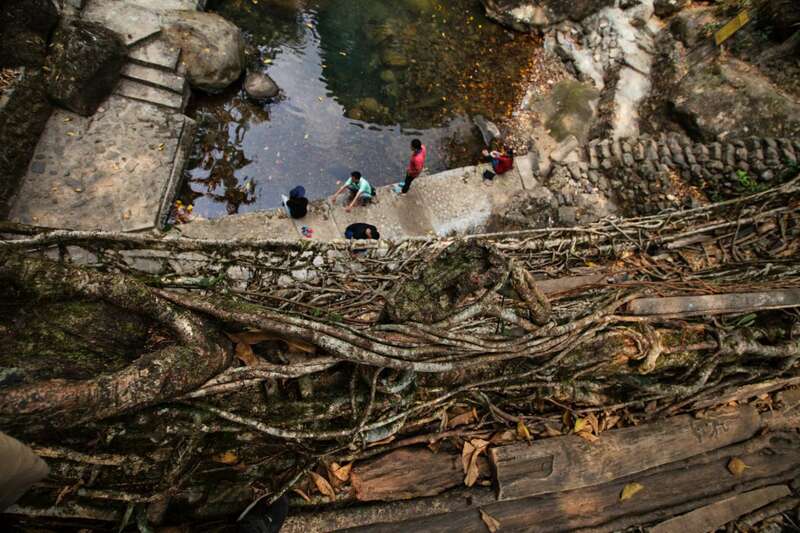 The community is resourceful and known for its skill at building living-root bridges. Our friendly driver shared his knowledge of Meghalaya state and its culture in the hour-and-a-half drive to Tyrna village, the last point beyond which the terrain is only accessible on foot. It’s here where the five-kilometre hike to the village of Nongriat begins. Perched at a dizzying height some 715 metres above sea level, carrying our big backpacks and looking down at the trek’s impenetrable-looking vastness, the 3,000 steps seemed terrifying. The steep descent did get my thigh muscles burning fast! But about 30 minutes into the hike I eased into it, and acclimatized to the warm and temperate climate of the valley. We walked a lot—but each new glimpse of this land of hill tribes, with its flowing river, thick tropical forests and fauna, and morning mist shrouding the Khasi hills, made me forget the weariness. At the bottom of the trail we reached the edge of the sunken river having no regrets. Beckoned by the feeling of calm that nature this magnificent inspires, we internalized all we saw of the tempting blue water breaking through the rocky landscape from above the vibrating thin steel wire bridge, which we had to cross with great caution. In these moments, it felt as if we were the only people in the world! The people of Nongriat live literally disconnected, a big part of its appeal to our writer. On reaching our abode—one of the two guesthouses in the village—the proprietor, Charlie, gave us information on all the places to see and where to camp in the area. Not long after, I noticed my cellphone had no signal bars. I was looking at four days without Facebook, email, texts and calls. Once I recovered from that realization, I quickly wanted to immerse myself in this little piece of heaven. The warm, calm lagoons of this mythical Shangri-La. Thankfully, our vacation was shaping up unexpectedly in a good way, becoming infused with a spirit of re-alliance—less egocentric, closer to nature, and to others. We walked around the tiny quiet hamlet, before settling for lunch at a bamboo shack overlooking a living-root bridge. The bridges are beautiful structures and the region is known for them, made by the hands of the Khasi community who weave the roots of rubber trees (ficus elastica) together with strong aerial roots. 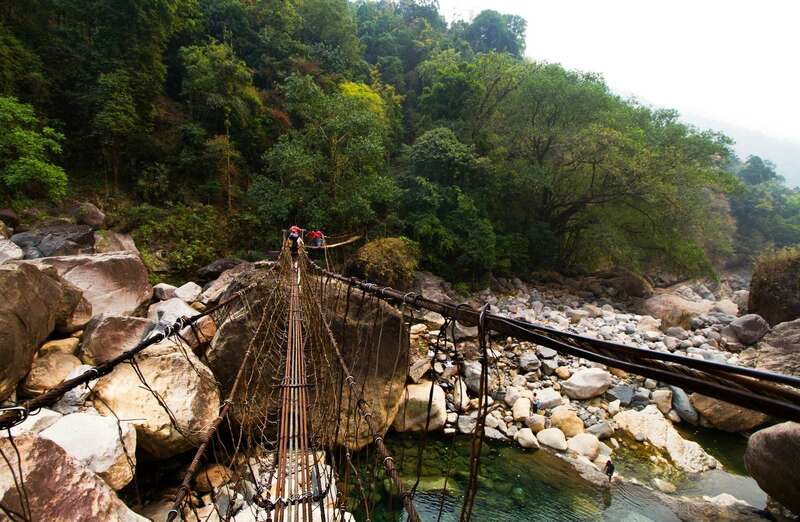 Constructed like this for about 500 years, the Khasi people continue to build these bridges whenever and wherever the need arises. It takes between 10 and 15 years to do so, and for the bridge to strengthen over time, multiplying entanglements. View from the top, a living-root bridge. A woman popped her head out of the window, asked us if we wanted to order lunch, and out loud shared the modest menu over the screams of her three rowdy children, who were constantly running in and out of the place. They ran toward us, laughing and smiling ever more—it was a very sweet moment. Inside a living root bridge! While waiting for our rice and pork, my boyfriend and I sat on a bamboo seat next to a person of the Khasi tribe, who greeted us and introduced himself. He was the husband of the owner of the restaurant. 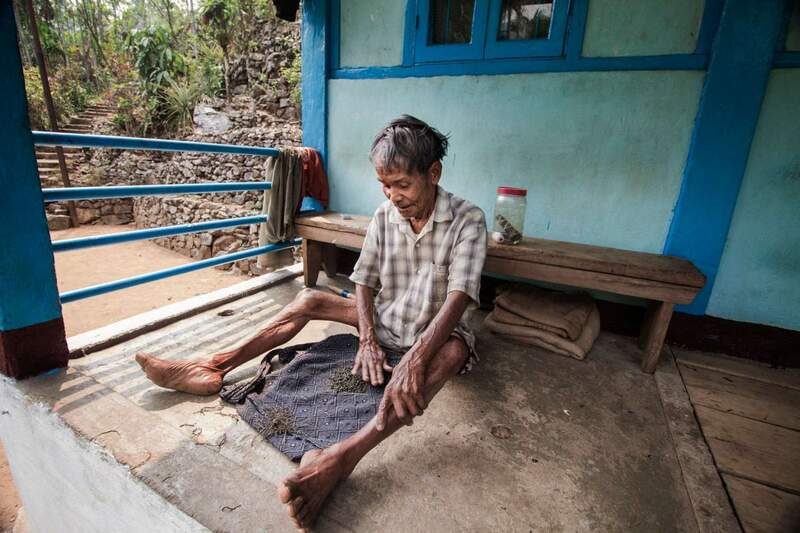 As a gesture of friendship, he offered us rice alcohol, which had been fetched that morning from his trek to the town of Sohra (also known as Cherrapunjee, it was once one of the rainiest places on Earth!). It was a robust wine, and we raised our glasses in mute tribute to an utterly unexpected, beautiful hidden valley and its people. Nestled in a rainforest in the Sohra Valley India. Just trekking, just chilling. In fact, the word is matrilineal. Khasi society celebrates women every day: no social stigma is attached to being female; women pursue studies, operate almost all businesses, dominate the household and make all family decisions in this region. And traditionally, only the younger daughter inherits. But husbands are beginning to revolt—they are ever-more demanding equality, and in some ways want even more power than their womenfolk. An elder sorting black pepper, one of the village’s main cash crops that many depend on for their livelihood. We were told of a great place to see the sunset, and so after lunch made our way across the living-root bridge and several others throughout the evening. The more I saw and felt of these natural-fiber bridges, the more they struck me as unique. 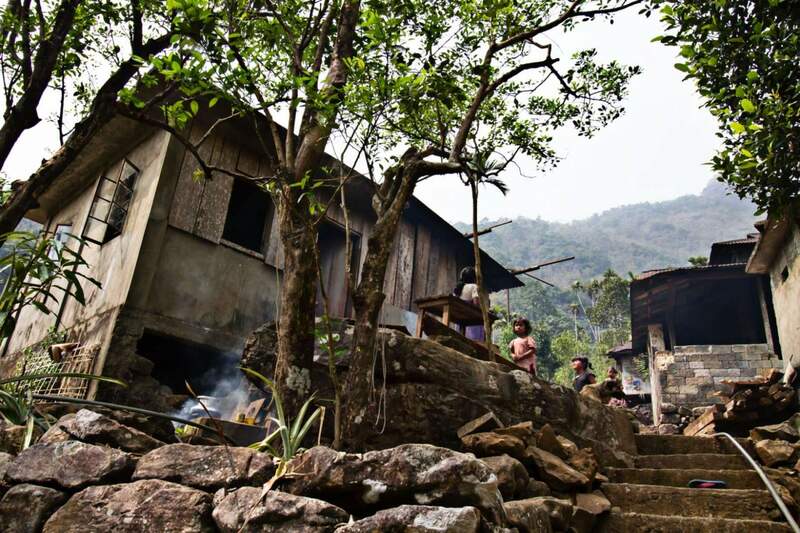 It is ingenious how the Khasi saw in outstretched branches a solution to monsoon onslaughts. They are a wonderful example of cooperation between humans and nature. By night, the village is a beauty to behold; the guesthouse is shrouded in a sort of perfect darkness, the sky is embellished with countless stars that is impossible to find in cities today. While our host and his daughter prepared a delicious vegetarian dinner for us, one of our new friends sang for us—he’s a talented vocalist and guitarist—and we all sat around a bonfire, eating and enjoying the music, the company and each other’s stories. The following morning, woken by sunrays dancing across the valley, we found our neighbours in the guesthouse had gone. From the terrace, we observed the village men and women leaving for work and heard the school kids murmuring. I was ready for our trek to Rainbow Falls (literally, a waterfall with a rainbow! ), an hour of ascent and descent. From the riverbed, paths wandered vaguely through the forest and climbed up into the hills. Hiking trails curled through the tropical forest, amid all the green of palm trees and virgin forest. In the cool morning air, we were there in an hour—rising around was the most sublime scenery, and a waterfall tumbled from a cliff, plunging at least a thousand feet in three long steps to the valley floor. The scenery here feels timeless. It’s a place where you could idle away a whole day, just sitting on the big rock and getting warm from the sun, listening to the sounds of water and birds. And I certainly did not say no to a small dip in the pool below the waterfall. Eventually, we stopped to have lunch and bask in the warm sun and abundant blue sky. Then headed down, in search of natural swimming pools and to bathe and refresh in turquoise waters. 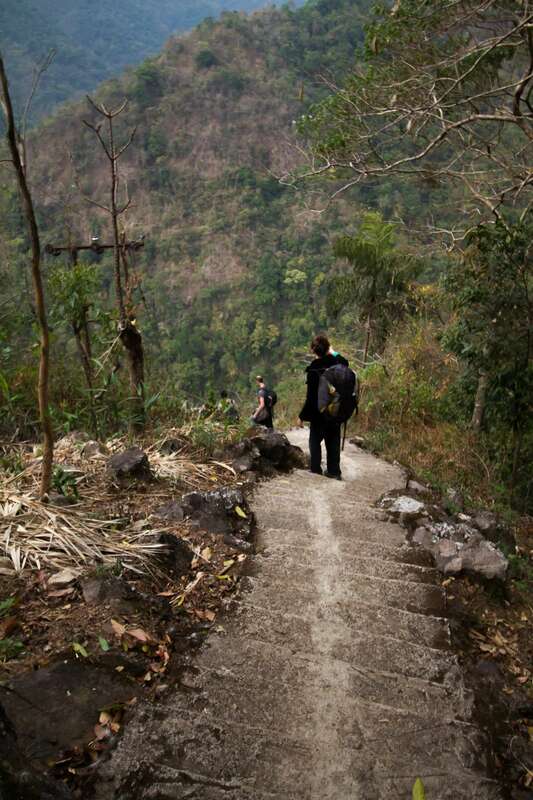 Tomorrow, we must hike up all those steps, so Paul and I can exit Nongriat and reluctantly return to civilization. Supriya by the blue lagoon! Why Go: To get to know yourself. Whether you decide on a day trip, a few days or even more, you will find no shortage of ways to get in touch with your nature-loving, spiritual self. Getting There: From Guwahati, take a cab to Shillong, then another cab or bus from Shillong to the village of Tyrna. Shillong to Tyrna is about 75 kilometres, and from Tyrna it’s a five-km trek to Nongriat. When to Go: The rainy season (or summer monsoon season) here begins in April and runs to September, and it rains almost every day. (The State of Meghalaya is known as one of the wettest places on the planet!) I recommend you visit in the dry season. Accommodation: It’s limited and rugged in Nongriat, with just two guesthouses for travellers that have squat toilets, bare mattresses, cold-water taps, home-cooked meals of dhal, rice and vegetables, chicken and pork (which were actually very good). A room costs approximately $12 a day; you can contact Byron at Serene Homestays (local number is 94.3673.9655), or Charlie at Village Guesthouse (local number is 85.7578.7340). For a day trip, you can hire a guide for about $15. For Extreme Adventurers: You can camp by the riverside, and ask Charlie or Byron about renting blankets, pots and pans, and other things you might need. What to Take: A few food items, a first-aid kit, medications, and any item you think you might need for a few days, as supplies in the valley are extremely limited. Having said that—I do recommend you travel light! Local Culture: In Meghalaya, 85 percent of the population is Christian; hence, the Christian calendar is respected and markets are closed on Sunday, as well as other restrictions. Do Keep in Mind: There are several sacred places around the village, by the river, and in the forest. Signs mark these spots, and I would recommend you respect the sentiments of locals by behaving in a respectful manner. There’s no littering, drinking, smoking nor being loud or blaring music at these sacred sites. 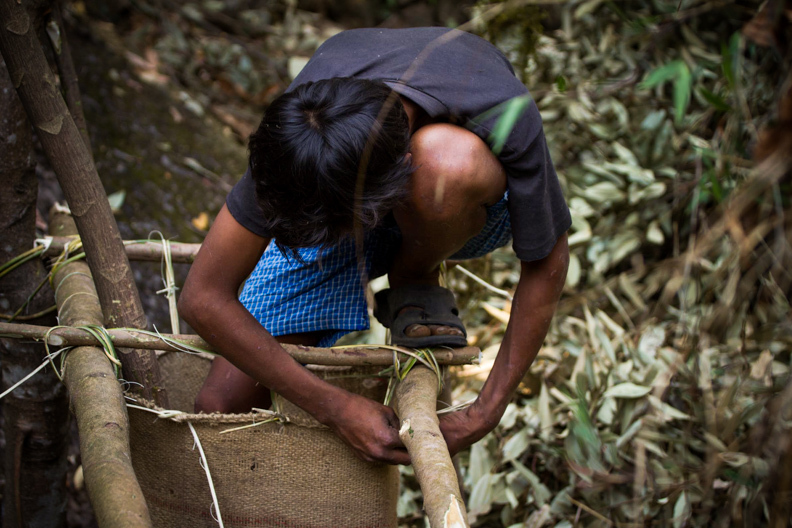 One Small Tip: The Khasi are traditional beekeepers. Wild honey here is delicious and a must-take from this dense tropical forest. Bottles are on sale at the guesthouse, you can choose between orchid honey and orange honey. A small bottle costs about $3. 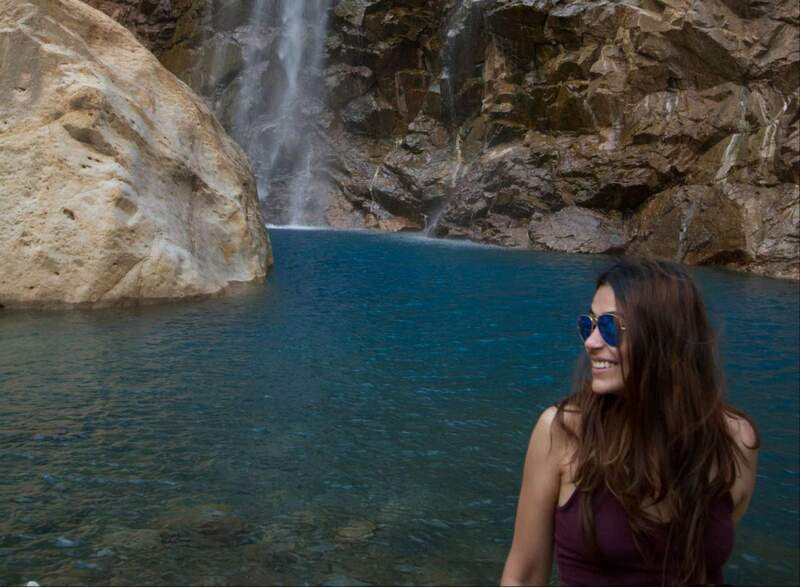 This is Supriya’s second story for Outpost Travel Media. Check out her very colourful piece on India’s famed camel fair here.